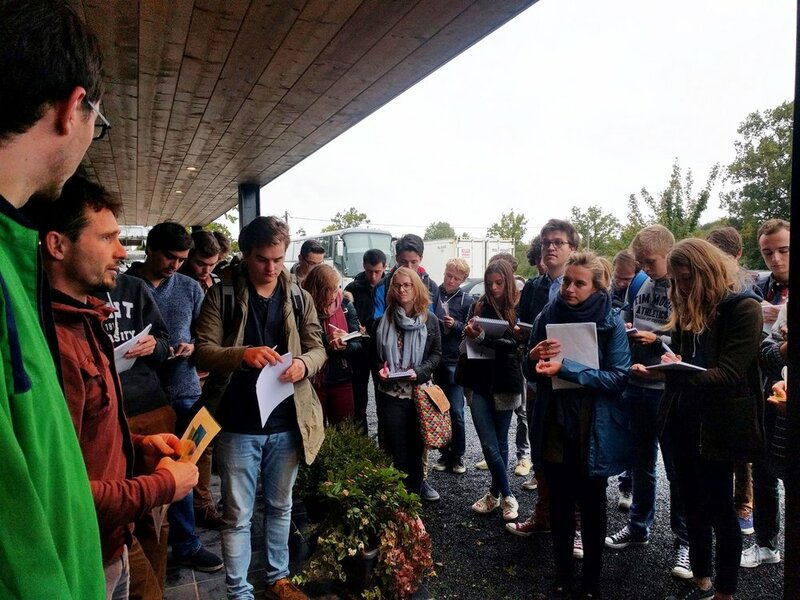 Glimps facilitated and curated the Circular Economy Bootcamp for Vlaanderen Circulair (VC) in September 2018. We co-designed with the team of VC a programme that was relevant, broad and daring, employing novel education and innovation tools. On-site, we guided the projects from kick-off to goodbye, made a buzz so that the outside world knew what was happening and trained the participants in essential entrepreneurial skills. Good vibes, great projects and happy participants! A buzzing crowd. The smell of mown grass and sunflowers comes at you. The soft feeling of fresh pasture under your feet. Your hands touch walls made of plants and mushrooms. As far as the eye can see is a green city, grown and growing with its inhabitants. This interactive installation invites visitors to fully explore their senses in the fitting-room of the post-fossil city of 2050. Winner of Post-Fossiel Gent competition by City of Ghent. 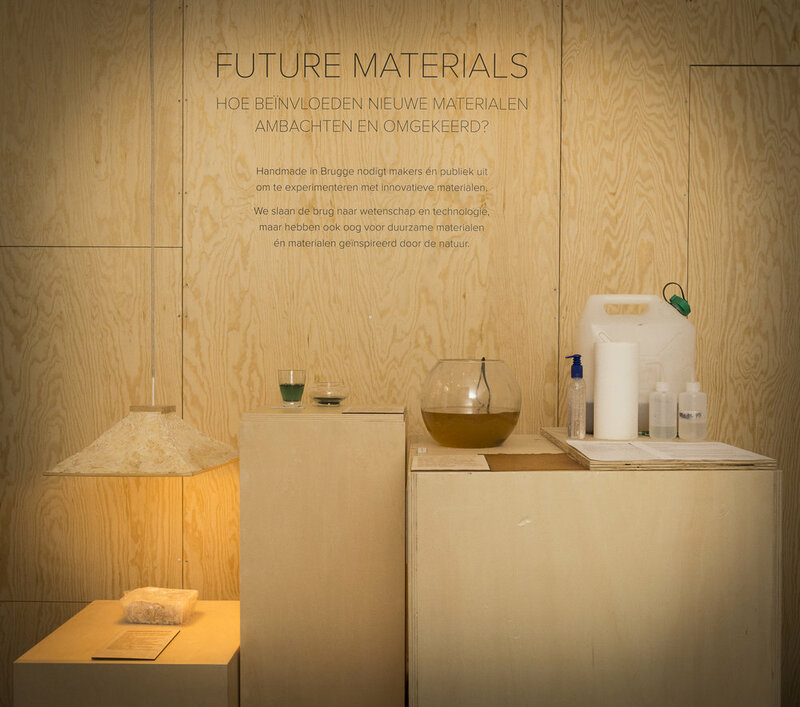 Future Materials explores how the designers' craft evolves with the use of innovative materials. Science, design and technology in the search for sustainable solutions inspired by nature. Featuring: mycelium objects, algae paint and vegetarian leather. In partnership with Handmade in Brugge. BioFab Forum intends to build a body of knowledge that is readily usable for everyone, anywhere in the world! Interested? Feel free to introduce yourself. Each month, PermaFungi recycles five tons of coffee grounds to produce 1 ton of mushrooms and 5 tons of champost in the cellars of Tour et Taxis, in the heart of Brussels. This lamp is made of the leftovers of the champost. Photo by Lore De Backer. Jewelry by Lynn Josephy. 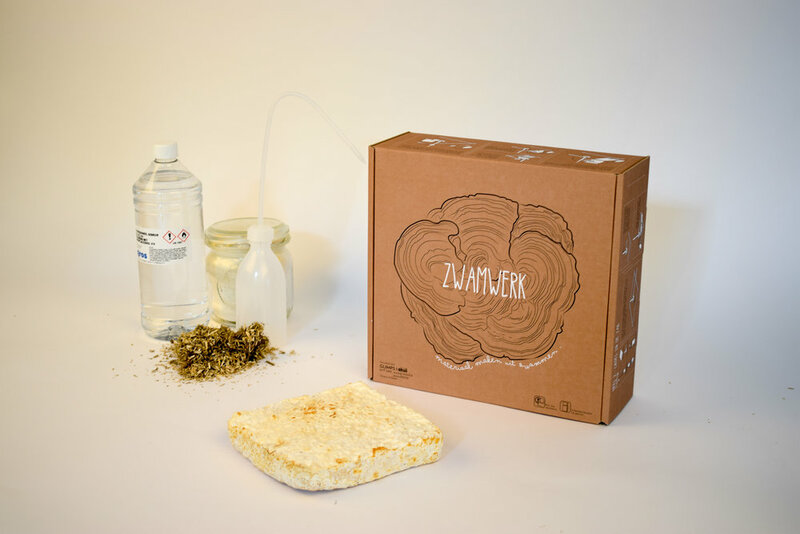 Zwamwerk is an educational kit on mycelium materials. It translates scientific knowledge into education for disadvantaged groups and schools and enables teachers to experiment during class. This follows from the sore points we noticed in biology education: there is a shortage of qualitative and accessible learning materials. Qualitative education is needed to ensure that qualified workers graduate in the future. We've taught students mycelium materials production and helped them to develop their products. During the project we have prototyped the first online education platform on mycelium materials. 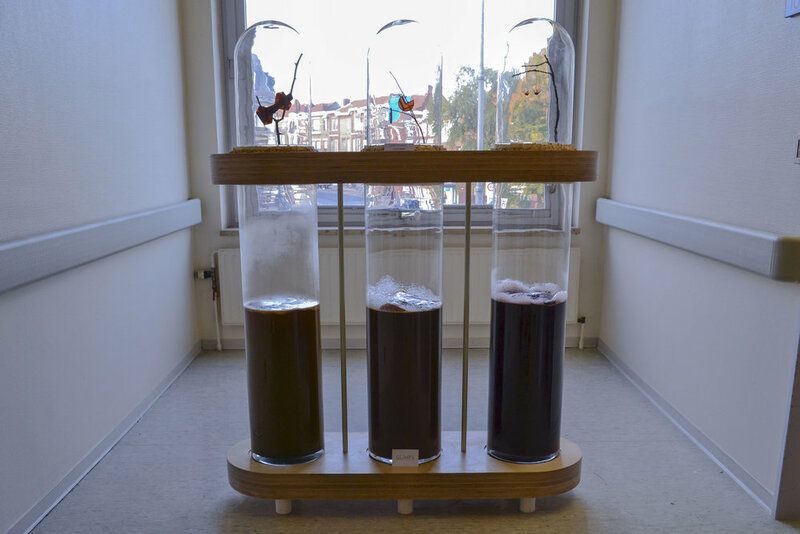 In partnership with Mycelia BVBA and UGent Industrieel Ontwerpen.